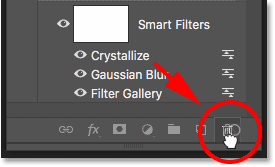 In this tutorial, I show you how to use smart filters in Photoshop! 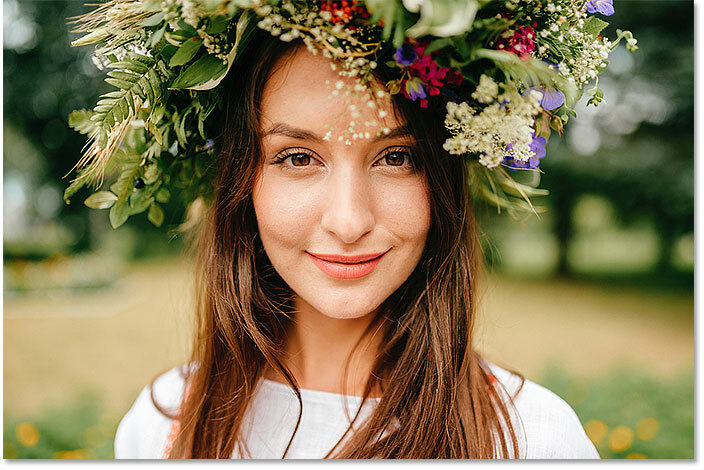 You'll learn everything you need to know about smart filters, including what smart filters are, and the advantages they have over Photoshop's regular filters. You'll learn how to apply and edit a smart filter, how to add multiple smart filters to a single image, how to control which parts of your image are effected by the smart filters, and more! We'll even learn how to apply Photoshop's most powerful filter, the Camera Raw Filter, as an editable, non-destructive smart filter! 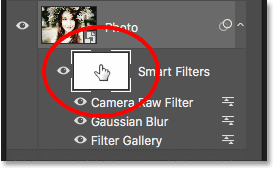 I'll be using Photoshop CC but smart filters are available in any version of Photoshop from CS3 and up. Let's get started! A smart filter is really just a normal Photoshop filter, but one that's been applied to a smart object. A smart object is a container that holds the contents of a layer safely inside it. When we convert a layer into a smart object, any changes we make are applied to the container itself, not to its contents. This keeps our changes both editable and non-destructive. 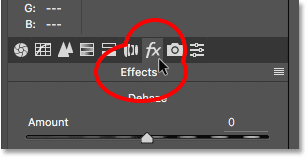 And when we apply one of Photoshop's filters to a smart object, the filter automatically becomes an editable, non-destructive smart filter! The main advantage of smart filters is that we can change a smart filter's settings any time we need without any loss in quality, and without making any permanent changes to the image. But there are other advantages as well. We can turn smart filters on and off, change the blend mode and opacity of a smart filter, and even change the order in which smart filters are being applied. Smart filters also include a built-in layer mask, giving us control over exactly which part of the image is being affected. And because smart filters are entirely non-destructive, they give us the freedom to experiment with different filters and filter settings without worrying about messing anything up. 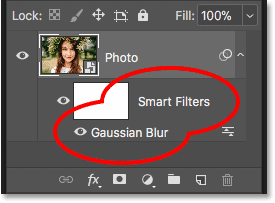 The truth is, if you're not using smart filters, you're missing out on one of Photoshop's best features, so let's see how they work! The image opens on the Background layer. 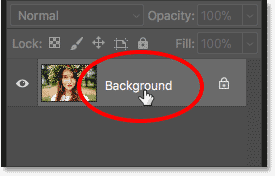 Start by renaming the Background layer. 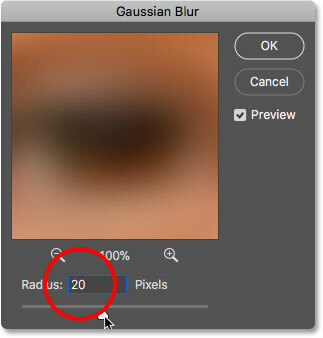 Adjust the blur amount with the Radius slider. Smart filters are listed below the smart object they've been applied to. Double-click on a smart filter to reopen it. 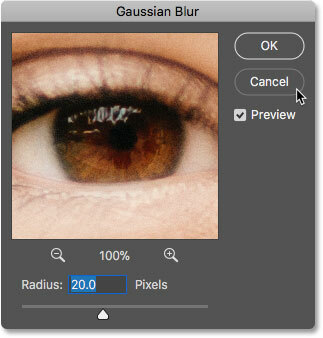 The same image after editing the Gaussian Blur smart filter. 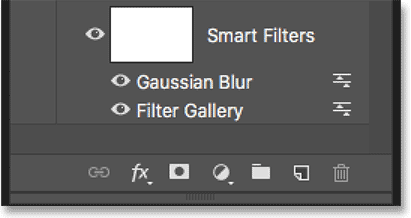 Each smart filter will have its own Blending Options icon. 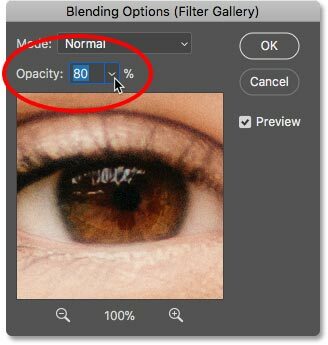 Here we can change the blend mode and the opacity of the filter. In other words, we're changing how the effect of the filter is blending with the contents of its smart object. 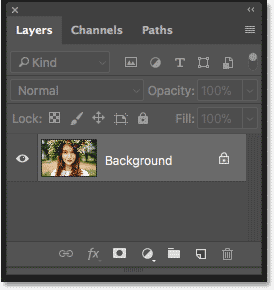 This is different from the Blend Mode and Opacity options in the Layers panel, which control how the layer blends with the layers below it. Here, we're affecting the filter itself. 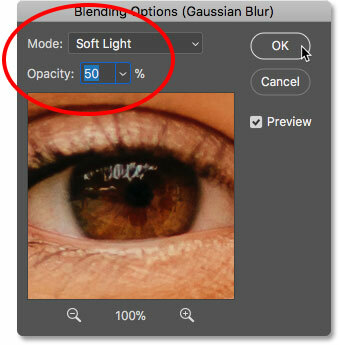 Changing the blend mode and lowering the opacity of the smart filter. 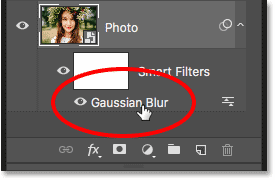 The result after changing the Blending Options for the Gaussian Blur smart filter. Use the visibility icon to toggle a smart filter on and off. 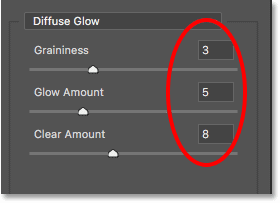 Selecting the Diffuse Glow filter. The Diffuse Glow filter settings. The effect using the Diffuse Glow and the Gaussian Blur smart filters. The Layers panel showing both smart filters. 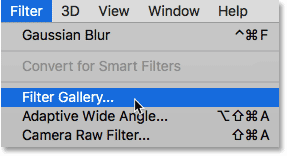 Opening the Blending Options for the Filter Gallery. Lowering the opacity of the Diffuse Glow filter. Drag smart filters up or down to change the order in which they're applied. 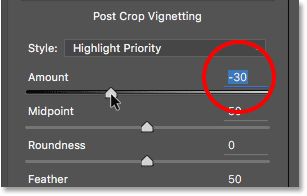 Photoshop is now applying the filters in the opposite order. The original (left) and new (right) version after changing the order of the smart filters. 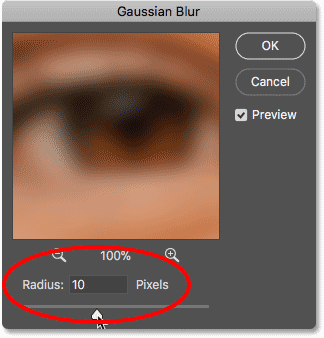 The Gaussian Blur dialog box reopens. Any smart filters above the selected filter will not preview until we're done with the edits. Click OK to close the message and edit the smart filter. Going to Filter > Pixelate > Crystallize. 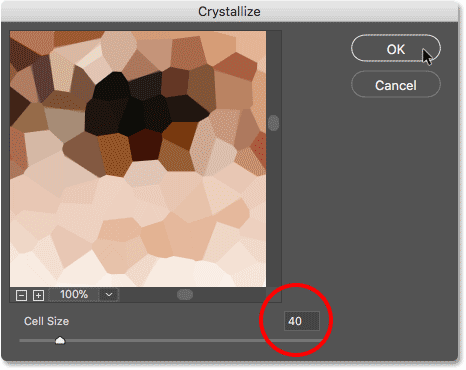 The Crystallize filter dialog box. The image now has three smart filters applied to it. Drag a smart filter onto the Trash Bin to delete it. 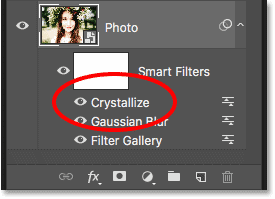 The effect after deleting the Crystallize smart filter. Let's add one more smart filter. 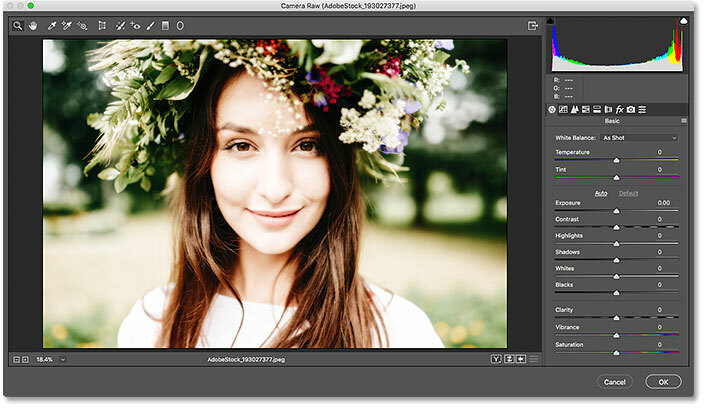 This time, we'll add the most powerful filter in all of Photoshop, the Camera Raw Filter. 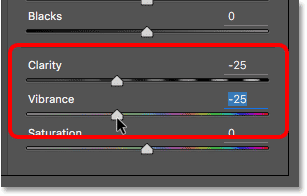 Note that the Camera Raw Filter is only available in Photoshop CC, so you'll need Photoshop CC to follow along with this part. The Camera Raw Filter dialog box. 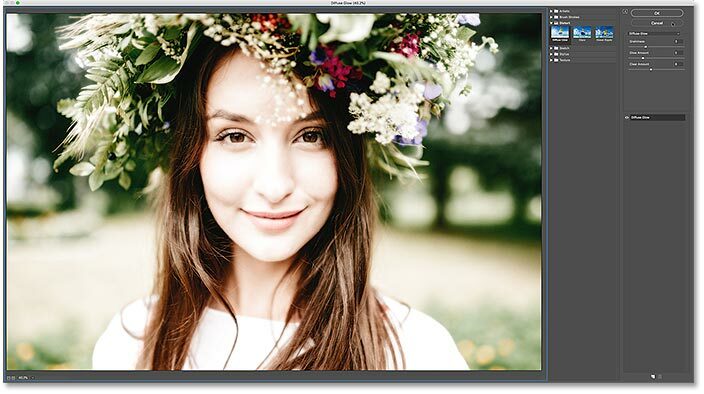 Lowering the Clarity and Vibrance settings in the Basic panel. The result after softening the image and lowering the color saturation. Reopening the Camera Raw smart filter. Switching from the Basic to the Effects panel. Adding a vignette to the image. The result after making more edits in the Camera Raw Filter. 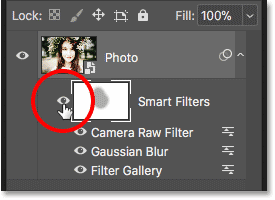 Use the layer mask to control the visibility of the smart filters. 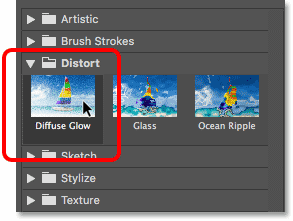 Photoshop uses the Foreground color as the brush color. Painting with black on the layer mask hides the effects of the smart filters. Going to Edit > Undo Brush Stroke. Undoing the brush stroke restored the filters. Lowering the opacity of the brush to 40%. Paint with a lower opacity brush to reduce, not remove, the effects of the smart filters. Use the main visibility icon to toggle all smart filters on and off at once. Viewing the original image with the smart filters turned off. The effect with the smart filters turned on. And there we have it! That's everything you need to know to start using editable, non-destructive smart filters in Photoshop! For more tutorials on smart filters, learn how to create a colorful twirl art effect, how to create a watercolor painting effect, or how to use smart filters with text! 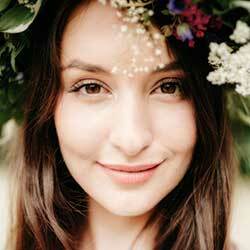 Or visit our Photoshop Basics section for more tutorials!